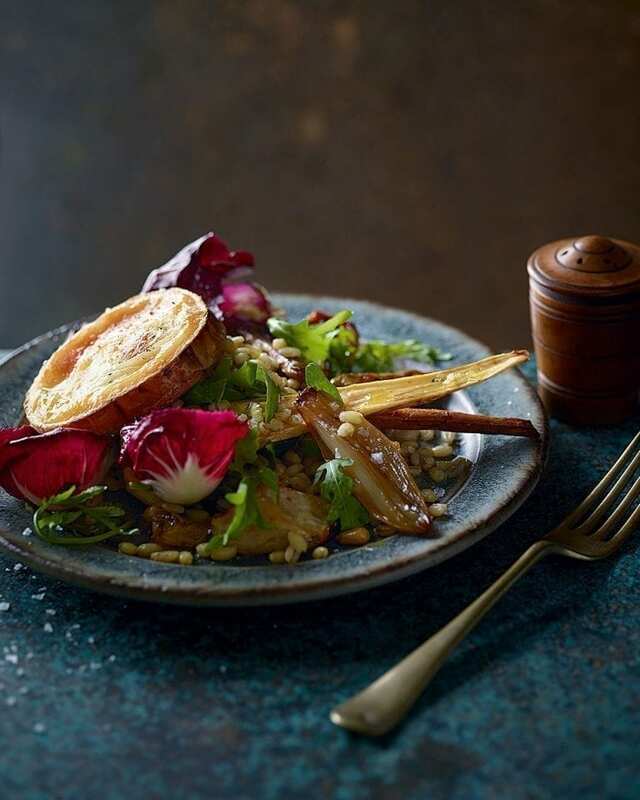 A warming salad recipe of roasted Jerusalem artichokes, parsnips and pear barley, topped off with creamy, tangy goat’s cheese. Heat the oven to 200°C/180°C fan/ gas 6. Toss the artichokes, parsnips and shallots in a tin with the 3 tbsp olive oil and the 2 tbsp sherry vinegar, season with salt and pepper and roast for 50-55 minutes, tossing occasionally, until golden, chewy and caramelised. About 20 minutes before the end of cooking, add the 2 tbsp honey and toss well to coat. While the veg is cooking, put the pearl barley in a large saucepan, cover with plenty of boiling water and simmer for 25-30 minutes until tender but still with some bite. Drain and leave to steam dry for a minute while you make the dressing. Mix the remaining 3 tbsp sherry vinegar with the 2 tsp honey and the mustard in a small bowl or jar and whisk with a fork until combined and thick. Season generously, then slowly drizzle in the 4 tbsp olive oil, whisking constantly to form a thick dressing. Put the pearl barley in a large mixing bowl and toss through one third of the dressing so it soaks into the warm grains. Toss through the radicchio, so it can wilt slightly. Once the veg is cooked, mix it into the pearl barley with the pine nuts and rocket. Taste and season. Lightly oil a baking sheet and heat the grill to high. Put the goat’s cheese on the baking sheet, drizzle over a little more oil, season, then grill for 4-5 minutes until starting to bubble and caramelise on top. Toss the rest of the dressing through the salad, divide among plates, top with a slice of goat’s cheese, then serve.